Whip-it! 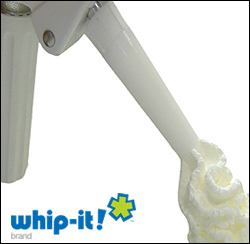 is a full featured line of N2O whip cream chargers, whip cream whippers, old-style soda siphons, and Co2 chargers. Here you'll find nearly the full line of Whip-it! items, all at eye-popping prices. Plus, you can now buy our chargers by the individual box, or by the case for even more savings. 1-1 of 1 matching items.